Puthia is a small village in north-western part of Bangladesh, containing the largest number of historical temples. Among them, Pancharatna Gobinda Temple is the most significant, located inside the palace, on the left-hand side of the inner courtyard. It was erected between 1823 and 1895 by Prem Narayan Roy, a Jaminder (feudal land owner) from Puthia royal family. This ornate temple is an imposing and excellent example of the five spire style (Pancha Ratna) temple architecture mixed with typical Jor-Bangla style. The temple is dedicated to Lord Krishna, as the Puthia royal family were converted to Vaishnavism by Radhamohana Thakura. Today the temple has a Krisna deity in the sanctuary for worship. Pancharatna Gobinda Temple is a large, square structure, built on a raised platform. It is 12.25 meters in size on each side. It has one central room which is the sanctuary, and four square size small rooms in four corners. There are four entrance in four side of the sanctuary, but the main entrance is located in the west side. The Cornish of the temple is a little curved in design. It has four ornate tower in the four corners, and a big central tower. Unlike the Kantaji Temple in Dinajpur, it has it’s towers intact. In 1886 and 1897 A.D. there were two great earthquakes on this area when most of the structures were severely damaged, including the palace of Puthia and not so far the towers of Kantaji temple. But because of the building technique, nothing happened to this temple. The stairs of this temple to go upstairs is located in the south side of the temple beside the entrance. The Pancharatna Gobinda Temple has exquisite terracotta ornamentation depicting the divine romance between Krishna and Radha as told in the Hindu epics. It also has battle scenery from Ramayana and Mahabharata, the epic Hindu books, and scenery of different Hindu deities, general life of people and culture, and floral and fauna. The Pancharatna Gobinda Temple is a must visiting place while visiting Puthia. To know more about the temples and the palace of Puthia, check out here: Puthia: An amazing village in Bangladesh full of beautiful temples. Have you visited the Pancharatna Gobinda Temple in Puthia? How amazing have you found it? Have I missed something? Share your experience and thoughts with us in comments. Any question about visiting Pancharatna Gobinda Temple of Puthia? Ask us here! Consider sharing it in social media so that more travelers can know about this beautiful country which is little known to everyone. 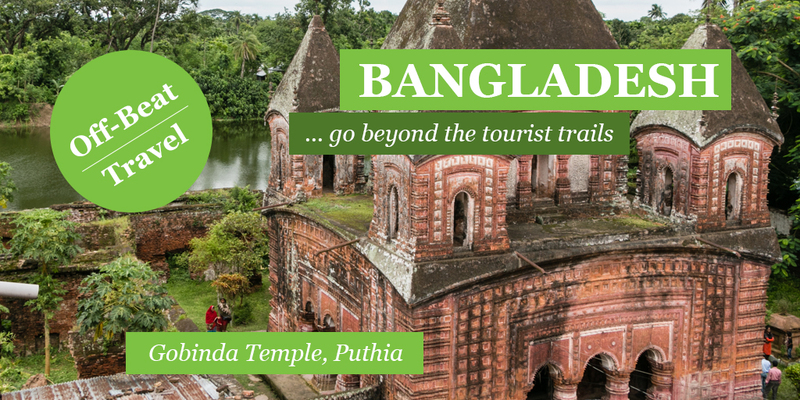 Check out our archaeological tours in Bangladesh to visit the most impressive archaeological sites including Pancharatna Gobinda Temple of Puthia, and our Bangladesh tour packages and holiday packages in Bangladesh to visit Bangladesh with comfort.